We are back with a fantastic new DEAL 014 for your enjoyment. 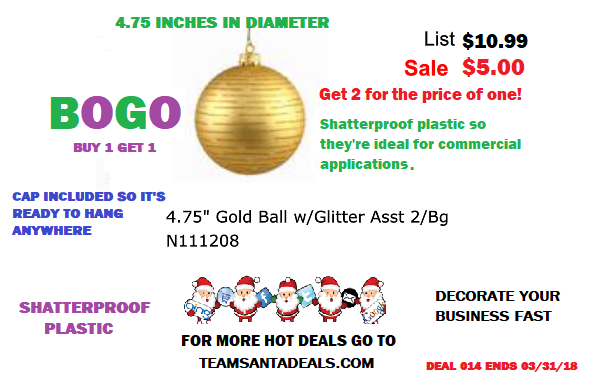 Today’s deal features a beautiful shatterproof, round, plastic ornament that is ideal for use when decorating a larger Christmas tree such as 10-foot tree. You can cover the tree using these gorgeous detailed ornaments. Each ornament is almost five inches in diameter and they’re shatterproof plastic too. Plus, they look exactly like glass. Our promise to you is that these round ornaments look exactly like glass Christmas ornaments. No question about it. Hang the gold ornaments anywhere you want but especially on a Christmas tree or garland. They would look awesome on a swag too. Like over the fire place. This ornament is perfect for just about any place you may want to use them. Hanging ornaments from the ceiling can also have a celebratory impact on the banquet room. Event planners used these same ornaments at a political function last month. These ornaments are absolutely beautiful whether you hang just one ornament, or you are hanging one hundred ornaments. With this BOGO SALE OFFER, buy one and get one free, this is a great opportunity for everyone who wants Cheap Christmas decorations to save $$. The price at $5 is below wholesale pricing. So, go enjoy and until we meet the next time it’s Happy Decorating!